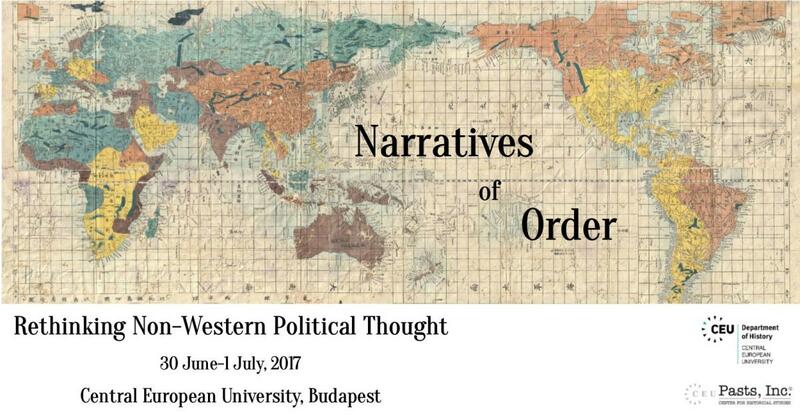 The workshop Narratives of Order: Rethinking Non-Western Political Thought, co-organized by CEU’s Department of History and Pasts, Inc. and supported by the Specialization in Political Thought at CEU, aims to address issues in the emerging field of global history of political thought. It builds on the idea that the recent “global turn” not only calls for the spatial re-orientation and geographical expansion of the history of political thought, but it also encourages further deconstruction of Western-centrism and highlights the need to rethink fundamental concepts and reevaluate the analytical vocabulary of the field. The workshop will provide space for debating methodological and theoretical questions on the basis of case studies from across the world, thus creating a comparative and transnational framework of analysis. Taking these cases as a starting point, the workshop also aims to investigate more generally the possible ways of developing a global history of political thought, the relationship between political discourse and historical narratives, the very relevance of the notion of the “political” in non-Western cultures, questions of conceptual transfers and translations, the relevance of comparative methods, and lastly, the issue of transnational entanglements. The organizers recognize that interdisciplinary approaches to the study of the global history of political thought are crucial. Therefore, we have asked for submissions from scholars of various disciplines in the humanities and social sciences, especially scholars of intellectual history, literature, religious studies, anthropology, philosophy, political science, and international relations. The working language of the workshop is English and it is open to public. Please RSVP to project coordinator, Alexandra Medzibrodszky (Medzibrodszky_Alexandra@phd.ceu.edu). Leigh Jenco (LSE) - Is There Such a Thing as Chinese “Colonialism”? Wiktor Marzec (IWM-Vienna): Narratives of Order and Chaos in 20th-century Eastern European Industrial City. Four Cross-sections of Urban Discourse in Łódź, Poland.